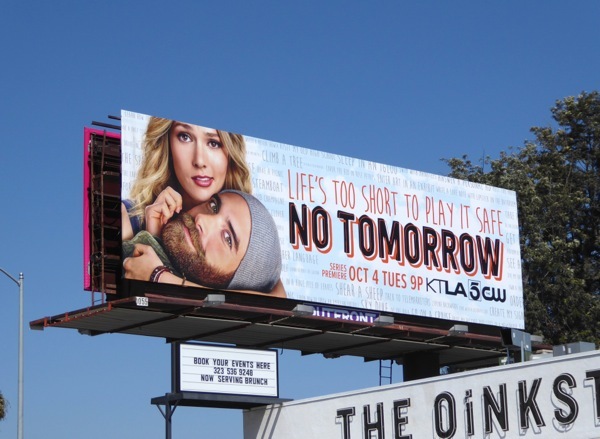 This Fall Tori Anderson and Joshua Sasse star in the offbeat romantic comedy No Tomorrow. 'Evie Gallahan' likes order in her life, but when her career stalls and her love life seems a bit dire, along comes the risk-taking, thrill-seeker 'Xavier Holliday' to make the control freak question her life's priorities. There's only problem with this handsome guy (and it's a doozy), he thinks the world is going to end in exactly eight months and twelve days (you never can tell the crazy ones). Yes the apocalypse is nigh, and that's why with help of her friends Evie will take a risk and try to check off as many things on her bucket list, or 'apocalyst', before the world comes to an end. These series launch billboards were photographed along L.A.'s Vine Street on September 16, then later along Pico Boulevard on September 18, 2016. For more ad creatives featuring 'tomorrow' in their titles make sure you check out this billboard for The Tomorrow People, these billboards for DC's Legends of Tomorrow, these Tomorrowland movie billboards and these Edge of Tomorrow movie billboards. If this was the end of the world as we know it, would you still have time to watch TV, or would you be out there doing something more fun and interesting instead. Just how much chocolate, cheese and ice-cream could you eat in eight months and twelve days anyway?